Steve McQueen's status as patron saint of all things automotive has only grown in recent years, but early in his career the actor wasn't above some poser subterfuge — like putting fake badges on an Italian roadster and calling it a Ferrari. Set to be sold at the RM Auction in Monterrey, Calif., on Saturday, this 1953 Siata 208S was one of the dozens of etceterini Italian sports cars companies that emerged from post-war Italy. Built around a 2-liter Fiat V8, the Siata was a graceful roadster, cloaked in custom alloy bodywork and appealing to those for whom Ferraris were out of reach. Only about 35 copies of the 208S were built, and but a handful survive. This one was sold in 1956 to McQueen, then an up-and-comer who'd recently moved to Los Angeles from New York to further his movie career. Even then, McQueen knew enough about cars to know that most people couldn't tell one Italian roadster from another. 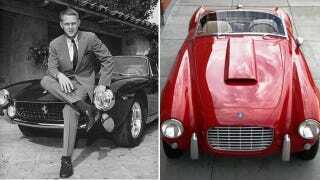 So he called the Siata his "little Ferrari," and attached a Ferrari badge to the front in place of the Siata's blue "S." In his book, "McQueen's Machines," Matt Stone writes that McQueen even boasted to another actor of getting a ticket for driving close to 150 mph on the freeway in his Ferrari. McQueen had gotten a ticket on the freeway — but it was for driving too slow, due to a transmission problem in the Siata. A Ford convertible came roaring up and forced [the Siata] to the curb. Out popped McQueen. There was no ‘Hello!' or ‘May I?...' He just walked up and said he wanted to drive the Siata. Sand moved to the passenger seat, and McQueen got in and went tearing off, heading up Coldwater Canyon and Mulholland Drive. "Steve drove the Siata flat-out," Sand continued. "I was glued to the seat and didn't even have the time to be frightened." At the end of the enigmatic adventure, "Steve pulled in behind his Ford. He hadn't uttered a word and just got out of the Siata and returned to his own vehicle." The restored and repainted Siata is expected to sell for up to $1.2 million this weekend, and whoever buys it will possess a little piece of Italian motoring history. Yet after multiple decades, it's doubtful anyone can truly own it like McQueen.